​​​​ BULVERDE – REOC Development began construction on the Singing Hills Professional Building, a 60,000-sf office building at US 281 and Harmony Hills St. The three-story building at 524 Singing Oaks will be anchored by an ambulatory surgical center on the first floor and is set to deliver in fall 2019. 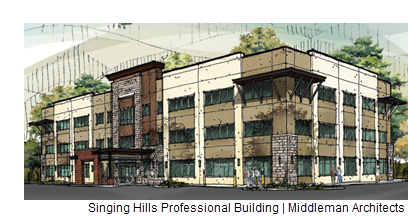 The approximately 65 percent pre-leased building is in the Singing Hills Development, a 250-acre mixed-use project with retail, multifamily, and residential components.